Substance use disorder is the most common psychiatric comorbidity in schizophrenic patients, with prevalence rates of up to 65%. Besides the legal substances tobacco and alcohol, cannabis seems to be the most illicit drug abused in schizophrenia patients and has been discussed as an important risk factor for developing schizophrenia. At least substance abuse may contribute to an earlier onset of schizophrenia as seen in many first-episode studies. Common hypothetic models for the increased comorbidity include the concept of increased vulnerability to each individual disorder, the model of a secondary substance use or psychotic disorder, and the bidirectional model. There is no common sense regarding a different neurobiological background for schizophrenia patients with and without substance abuse. Previous substance abuse (primarily cannabis) seems not to lead to pronounced structural brain abnormalities in schizophrenia, but may cause functional changes on cortical inhibition processes and synaptic transmission involving mainly the GABAegic, glutamatergic and dopaminergic system. The key issue in providing treatment for this population is developing a dual disorder approach that integrates treatment of substance abuse and schizophrenia. Many programmes are now providing this integration through interdisciplinary teams with expertise in the treatment of schizophrenia and substance abuse. This form of treatment features assertive outreach, case management, family interventions, housing, rehabilitation and pharmacotherapy. It also includes a stagewise motivational approach for patients who do not recognize the need for treatment of substance use disorders and behavioural interventions for those who are trying to attain or maintain abstinence. Nevertheless, that the evaluation of combined treatment programs with motivational elements, psychoeducation and cognitive-behavioural approaches shows an effect in reducing substance abuse and in decreasing frequency and severity of psychotic decompensations, there is only a slight advantage over routine care. 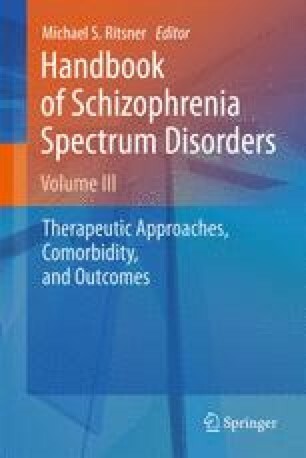 Pharmacotherapy of patients with the dual diagnosis of a schizophrenia and comorbid substance use disorder is a highly challenging topic because this subgroup of patients shows a high relapse rate, low treatment adherence and high rate of side effects. Recommendations for antipsychotic pharmacotherapy in schizophrenia are mainly based on studies that excluded patients with this dual diagnosis. The preferred pharmacological strategy depends on the target symptoms: improvement of schizophrenic psychopathology, reduction of craving and substance use, treatment of concomitant symptoms like depressive mood or management of side effects. Data, mainly based on open studies or case series, suggest superior efficacy for second generation antipsychotics (SGAs) over conventional antipsychotics (FGAs) with regard to improvement of the above mentioned target symptoms. Antidepressants and anti-craving agents (naltrexone) given adjunctive to antipsychotic maintenance therapy showed efficacy in reducing substance use and craving. In conclusion, there is an increasing need to proceed researching the pathophysiological background of this comorbidity to develop new treatment approaches. The insight into the pathomechanisms of the endocannabinoid system may help to find innovative treatment strategies in schizophrenia without substance abuse.